I'm sure most social conservatives in this country would agree that Christianity is seen by the liberal world as a source of evil. I can accept that a group of people would have a negative opinion - it's their right. What I find most frustrating are the times when this opinion gets expressed in the journalism world. Deep inside, I still hope and expect journalists to be neutral. This doesn't happen often these days, but I am allowed the hope. The recent Dearborn, Michigan clash between a group of Muslims and Christians has further proven that I need to keep on hoping. Where has the media coverage been? Even on conservative talk, there has been hardly a peep about this. Every now and then it was brought up, but that is it. They practically laugh about it. Sure, they laugh in the, "Hey, look, here's another case of Muslims being violent and it being ignored," and say nothing more. Then there is the Christian community itself. Crickets. Back to the Michigan event. A Christian group called the Acts 17 Apologetics showed up at an Arab International Festival. They were supposedly there to pass out flyers and to spread the gospel. I have to say, I do have a qualm with this. They carried signs that highlighted phrases "Sin and Hell" and "Lake of Fire"and "Islam is a religion ... Blood and Murder" which to me isn't exactly WWJD compliant. But, I'll save that rant for another time. They, however, did not take part in any actual violence. Sure, they may have chanted, spoke over a bullhorn, etc, but they didn't take to violence. It is their right to gather. You can disagree with what the signs say, their presence, etc, but they have a right to gather. 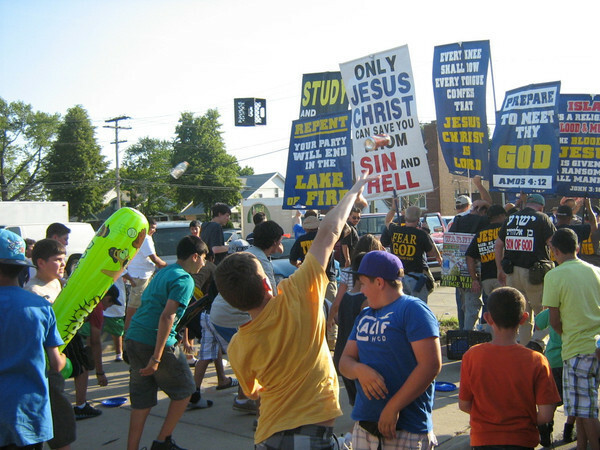 The DearbornPatch described the Acts 17 Apologetics as radical and the Examiner described it as "a religious fiasco of minor import [with] a small group of Christian provocateurs" and "Christian extremists". The worst that was said about the Muslim group, the ones that threw stones, bottles, chairs, concrete, etc, was "they were angry" or "angry Muslims". They were also called "counter-protesters" who reacted with "words and actions". Additionally, when interviewed, the Muslim Sheriff Jaafar is quoted saying, "[It's a] great family-oriented festival. The atmosphere right now is phenomenal - all the kids are having a good time, and we're doing our best to keep everyone safe and I think our guys are doing a great job at it." Please notice the picture of the group of teenage boys throwing the bottles and other debris. Good fun, that! No one was arrested. A whole group of Muslims violently react to an, admittedly, annoying group of Christians. Christians get arrested for creating gun clubs. (It might have been more, but they hadn't committed any crimes at the time they were arrested. And I think it is fair to say the Federal Gov't is out of control. According to Jefferson, it is expected that groups SHOULD rise up when this happens. Read the Declaration of Independence if you doubt.) Muslims start a mini-riot and get patted on the back. Well, except for the two Muslims charged with disorderly conduct. Except, there were a lot more than two participating. The police were there. They saw the whole entire event. They watched the Muslim crowd get angry and react by throwing stones and other objects they could find. They watched the bleeding Christian group stand their ground even as they were being pelted. The police even told the Christian group they were not allowed to use a megaphone. But, at no time, did the police try to stop the Muslims from getting violent. The discrepancy between how the Muslim group is described and the Christian group. The Muslims were "angry" while the Acts 17 group is radical and extremist. There is no outrage or surprise that not a single "counter-protester" was arrested for being violent. And there is benevolence toward the police, even as the police say they were happy with the outcome. If the roles were reversed, and it was the Christians that reacted with violence towards a Muslim group, I guarantee the headlines would read, "Overzealous Christians attack and injure several innocent Muslims. 10 Arrests Made." There was that church in Indiana that had a video posted of a boy talking about homo's not making it to heaven that made all sorts of headlines. And this was indoor. On private property. And no stones were thrown. Yea. Media bias against Christians.